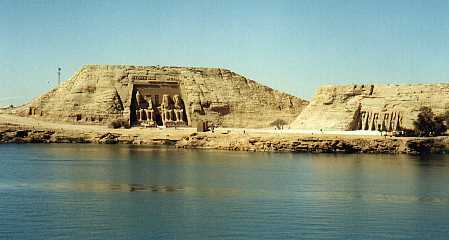 Two massive rock-cut temples on the western bank of lake Nasser in the reign of Ramasses II. Dedicated to Rameses II and his wife Nefertari. 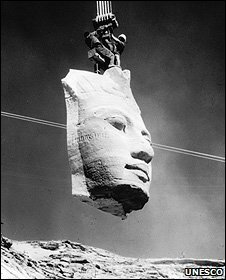 The whole complex was taken apart piece by piece and moved further uphill in the 1960's, following the development of the Aswan Dam. 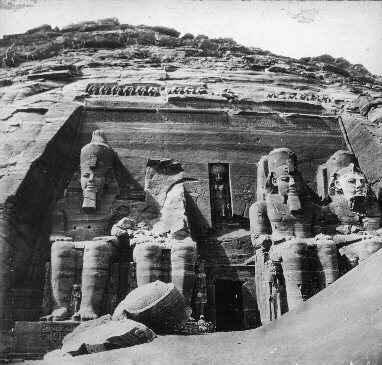 The 'Great Temple' at Abu Simbel, was completed around year 24 of the reign of Ramesses the Great (which corresponds to 1265 BCE). It was dedicated to the gods Amun, Ra-Horakhty, and Ptah, as well as to the deified Ramesses himself (2).The temple of Hathor and Nefertari, also known as the Small Temple, was built about one hundred meters northeast of the temple of Ramesses II and was dedicated to the goddess Hathor and Ramesses II's chief consort, Nefertari. 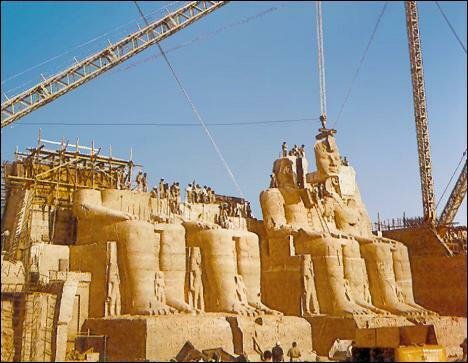 When the conservation efforts to preserve the temple from the soon-to be built High Aswan Dam and its rising waters were begun in the 1960s, images of the colossal statues filled newspapers and books. The temples were dismantled and relocated in 1968 on the desert plateau, 200 feet above and 600 feet west of their original location. 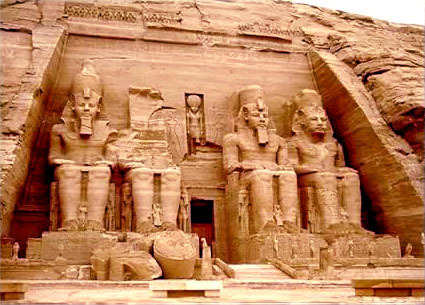 The salvage of the Abu Simbel temples began in 1964, and cost some USD $40 million. Between 1964 and 1968, the entire site was cut into large blocks (up to 30 tons averaging 20 tons), dismantled and reassembled in a new location – 65 m higher and 200 m back from the river, in what many consider one of the greatest feats of archaeological engineering. 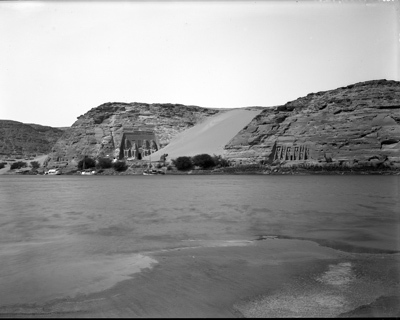 Some structures were even saved from under the waters of Lake Nasser. Today, thousands of tourists visit the temples daily. Guarded convoys of buses and cars depart twice a day from Aswan, the nearest city. Many visitors also arrive by plane, at an airfield that was specially constructed for the temple complex. 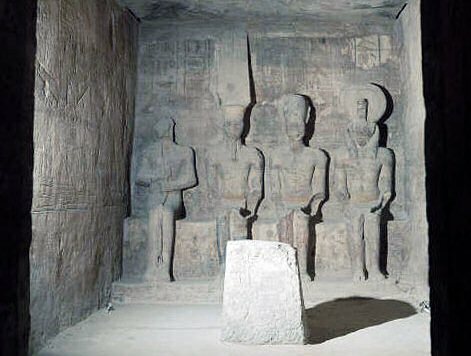 The axis of the temple was positioned by the ancient Egyptian architects in such a way that twice a year, on October 20 and February 20, the rays of the sun would penetrate the sanctuary and illuminate the sculpture on the back wall, except for the statue of Ptah, the god connected with the Underworld, who always remained in the dark. (2) These dates are allegedly the king's birthday and coronation day respectively, but there is no evidence to support this, though it is quite logical to assume that these dates had some relation to a great event, such as the jubilee celebrating the thirtieth anniversary of the pharaoh's rule. In fact, according to calculations made on the basis of the heliacal rising of the star Sirius (Sothis) and inscriptions found by archaeologists, this date must have been October 22. 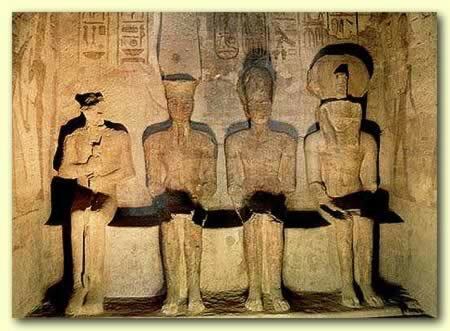 This image of the king was enhanced and revitalized by the energy of the solar star, and the deified Rameses Great could take his place next to Amun Ra and Ra-Horakhty. It is widely believed that this event now occurs several days later than it did originally due to the displacement of the Temples. Images of the original temple, in its original setting. The two temples were still separated by a bank of sand in 1906. 1). Emmekine Plunket. Calendars and Constellations of the Ancient World. 1997. Senata Books. 2). Alberto Siliotti, Egypt: temples, people, gods. 1994.